This is a real Golden Oldie, which I got off the Net, but without an attribution. If you know it, could you email it to me for inclusion? Thanks. Occasionally your car would die on the freeway for no reason. 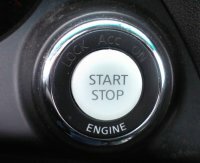 You would have to pull over to the side of the road, close all of the windows, shut off the car, restart it, and reopen the windows before you could continue. For some reason, you would simply accept this. 30 March 2012: Robert Hill emailed to say: I saw your joke post from the "if cars were like computers" and thought you would like to see that #10 is true now. 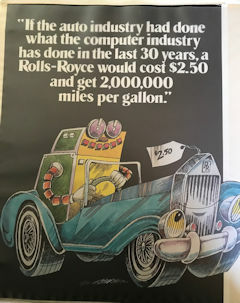 19 August 2017: Jack B. Rochester emailed to say: Attached is an image from an advertisement in Computerworld newsmagazine, circa 1980-81, for the magazine itself. I was a senior editor there at the time and used this image for the cover of a proposal for my book, The Naked Computer, which was a national bestseller in 1983.